Denbury Farm is close by many attractions and days out venues. A few below are within 1/2 an hour. There are many more including seaside resorts, quaint harbours and historic medieval villages within an hour. We are situated between two coastlines. On the channel cost that is a drive of a little over an hour is the Jurassic Coast for Charmouth, Lyme Regis, Sidmouth and many more exciting places to spend a day and to explore and even hunt for fossils. Dunster the Gateway to Exmoor with over 200 listed buildings Dunster is preserved so that generations to come can enjoy the historic qualities of this unique village. 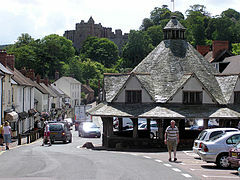 Dunster has a wealth of historic buildings, from the National Trust’s 11th century Dunster Castle to the Old Yarn Market in the middle of the High Street, which was a focal point for the old Exmoor wool and cloth trade. Of course if it is quality shopping you are looking for then you will be spoilt for choice with an abundance of exclusive galleries, shops selling gifts, toys, hand-made confectionery, clothing, designer jewellery, antiques, second hand and new books, local arts and crafts, and much, much more. Dunster shops strive to achieve quality, offer the unusual and provide a truly unique shopping experience. Dunster Castle a National Trust property and visitors attraction is an ancient castle and comfortable country home with dramatic vistas and subtropical gardens.Dramatically sited on a wooded hill, a castle has existed here since at least Norman times, with an impressive medieval gatehouse and ruined tower giving a reminder of its turbulent history. 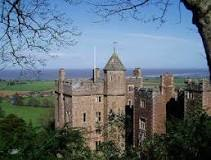 The castle that you see today became a lavish country home during the 19th century for the Luttrell family, who lived here for 600 years.The castle boasts spectacular views toward the Bristol channel, the Quantock hills and up to the moors of Exmoor. West Somerset Steam Railway. The West Somerset Steam Railway is a 22.75-mile heritage railway line. It operates services between Bishops Lydeard and Minehead using both heritage steam and diesel trains. The journey takes you through the beautiful Somerset Countryside and a small section of coastline where you can stop off at any of the 8 stations all with there own character. Minehead offers a superb destination for families seeking a traditional seaside experience and is the gateway to Exmoor National Park. It is equally suitable for those who want a relaxing break or an action packed holiday of walking, cycling, horse riding or extreme sports. Minehead provides a great base to explore Somerset and Exmoor whatever your means of transport, we hope the information on this site will entice you to come and visit Minehead, we are open all year and every season provides different opportunities. You can also use the Butlins facilities for a small charge. Watchet A charming little coastal town with an active Marina. An Old Port, quaint houses and shops, many walks in beautiful countryside, along the interesting coastline or just sit on the Esplanade with a cider or an ice cream – both locally made of course. Watchet was first recorded during the dark ages, when St Decuman arrived from South Wales and acted as a physician, arbitrator and pastor to the local community. He arrived on a raft with a cow as a companion! 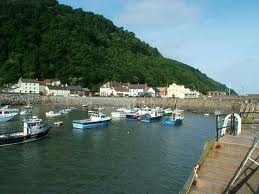 Watchet gets its name from WACET, the blue dye found in the cliffs. 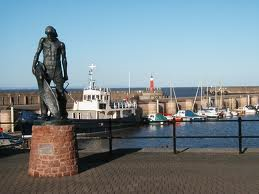 Watchet was an active port with a host of commodities being traded up and down the coast, to Ireland and Wales, while the Mineral Line brought iron ore down for shipment to Wales. Watchet also has the second highest rise and fall of tide in the world, so be prepared if you wish to see the fossils or walk the beaches. Exmoor National Park contains an amazing variety of landscapes within its 267 square miles. It has has amazing wildlife and of course running free the Exmoor Ponies. A unique landscape of moorland, woodland, valleys and farmland, shaped by people and nature over thousands of years. Where high cliffs plunge into the Bristol Channel, and cosy pubs and tearooms offer delicious local produce. Quantock Hills Are an area of wilderness and tranquillity being the home of England largest herd of Red Deer. Panoramic views lead you through coast, heath and combe. Explore and you will find rocky Jurassic coastline, exposed heath land summits, deep wooded combes, undulating farmland and attractive villages all within this protected landscape. The Quantock Hills are an Area of Outstanding Natural Beauty (AONB), which means that its distinctive character, natural beauty and cultural heritage are so outstanding that it is in the nation’s interest to safeguard them. The area received its protected status in 1956. This precious and ancient place with its distinct cultural heritage and village communities is hugely valued locally as a native or adopted homeland and workplace, as well as a favoured educational, recreational and even spiritual resource. These hills, which are largely privately owned, accommodate up to half a million visits a year, mainly from people who live within sight of them. Physically the Quantocks offer great diversity, reflecting the relationship between the geology, slopes, and exposure of the area and the range of past and present human activities and influences. This jigsaw of varied landscapes gives the Quantock Hills a distinctive character that includes its historic and cultural elements, scenic beauty and upland nature and the range of wildlife interest present. Tropiquaria Animal and Adventure Park A great day out for adults and children of all ages. Hold a snake or tarantula in the Tropical Hall, visit the amazing puppet show and the newly redecorated aquarium. For a nostalgic experience see the Radio Museum. Outside play for hours on the full-size pirate ships or in the Indoor Play Castle, and don’t forget the animals all around our grounds. Hours of fun, rain or shine!